Hip Hip Hooray!!! It's my 40th original painting!!! 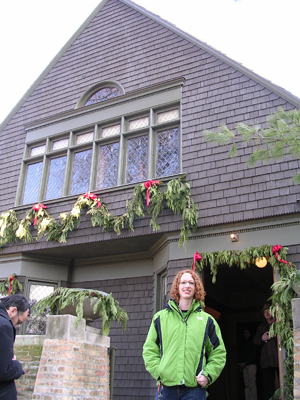 While in Chicago last January, I visited the famous architect Frank Lloyd Wright's home. While on a tour of his neighborhood, the tour guide showed us a house that he built in his famous Prairie style, and said it was on the market for 5.5 million dollars. As I continued the tour, I thought about if I ever had that much money, if I could, in good conscience, buy that house. And I think that even though it's an important artistic masterpiece, I probably wouldn't do it. But the basis of this conviction comes from the thoughts that I have been having about poverty. I have been pondering questions like why are people/races separated by railroad tracks and highways? And why are there people in places like Africa that only get to eat every 3 days? Or even worse why are people (me included) so apathetic to the people in need right in front of them? However, part of me also knows that even if I had 5.5 million dollars to give away, money would not solve this problem. It would be a temporary fix and would be great for a while but ultimately I think the problem is much deeper and more complex. So then my question became: How can I truly help those in need around me? So as I pondered all of these thoughts and looked through my book of Frank Lloyd Wright Windows on the plane ride home, I was inspired with the idea for this painting. The viewer of this painting is placed in the role of a person inside an expensive house peering though a Frank Lloyd Wright window. As they peer out the window, they see what at first seems to be a cheerful scene of a beautiful autumn day. But as the viewer looks closer they soon realize that they are in fact in a poor neighborhood as they see a plastic bag stuck on the tree branch and the boarded up windows and graffiti on the building across the street. The graffiti on the building is meant to help get the idea of poverty across as the tag name "poboy" indicates. The other graffiti words ("coldwata" and "geesus") are meant to be an allusion to Jesus and some of his ideas that are described below. So while experiencing this painting the question soon becomes is the viewer poor or rich? And do they truly see the poverty that is around them? So do I have all the answers? Well, obviously not. But I think that the best way to fight poverty and need is to do what Jesus taught us to do: love. Jesus once said that the two greatest things a human can do are to love God with all your heart and to love others as yourself. Jesus describes this kind of love in the book of Matthew when He says "I tell you the truth, whatever you did for one of the least of these brothers of mine, you did for me." (Matthew 25:40) "... For I was hungry and you gave me something to eat, I was thirsty and you gave me something to drink, I was a stranger and you invited me in, I needed clothes and you clothed me, I was sick and you looked after me, I was in prison and you came to visit me." (Matthew 25:34-36) And also earlier in the chapter where Jesus says, "...if anyone gives even a cup of cold water to one of these little ones because he is my disciple, I tell you the truth, he will certainly not lose his reward." (Matthew 10:42) So what Jesus is talking about is quite revolutionary and I believe it to be the answer: quit being selfish and love people. Imagine how the world would be changed if we really would care for the poor in this way- not only in kind words or yearly donations, but in actions and time. Imagine. So, in short, the solution seems to be impossible: to love unselfishly. To be part of the solution we must be willing to feed and clothe and care for those in need around us. However, only God can supply us with the love that is required to do so. Or am I part of the disease?" See a Frank Lloyd Wright window here. (Left) Frank Lloyd Wright house for sale: $5.5 million. 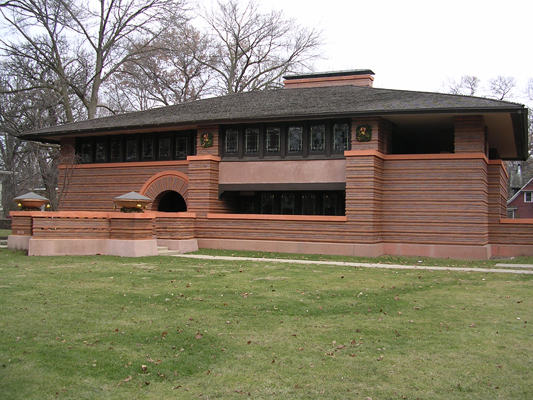 (Right) Amy in front of Frank Lloyd Wright's home in Oak Park, IL.